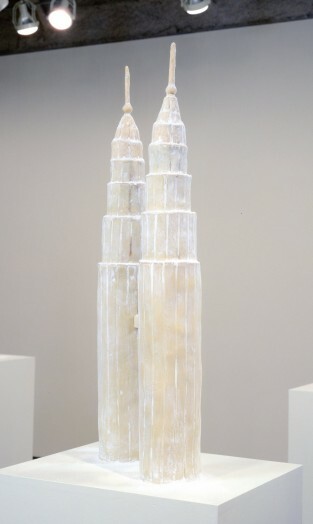 Coming Millenium, 1997-98, 3′ x 4″ x 4″, cake & icings. 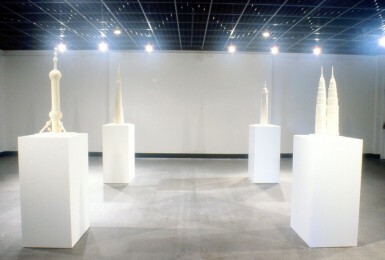 Coming Millenium used media representations of the world’s tallest skyscrapers being built at the time of the exhibition as the basis for four 40′ to 50′ models in cake, ganache and icings. Up only for the length of the show, the pieces spoke to the continued fragile and temporal ideological project of equating monumental height with power.